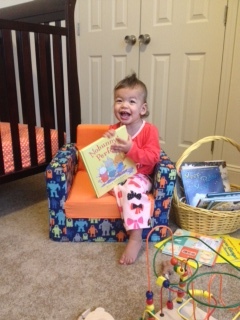 I love that my granddaughter is always reading! Whether she’s in her mommy and daddy’s lap or on her own, she gravitates toward books – this morning she read LOTS of CURIOUS GEROGE. 🙂 the photo here is her special reading spot! When my four kids were younger, it never seemed like there were enough hours in the day to read as many books as I wanted to share with them. So one summer, we had a reading contest – boys vs girls. The 2 girls shared a room. The 2 boys shared a room. On their bedroom doors, I taped a tree trunk made of brown paper bags. Then I cut out lots of green construction paper leaves. If an older kid read a book to one of the younger two, they got a leaf. Every time an older girl or boy completed a chapter book, that kid got 2 leaves. The leaves went on the tree with the name of the books and the kid/kids that read it. Every week, we did a leaf count for prizes – or a trip to the bookstore, park & fast food picnic. End of the summer, the kids had LUSH trees on their doors. I’m so excited to see their love of books carried on into the next generation! What books did you enjoy as a kid? I’m re-visiting some of my favs with my granddaughter – like PAPERBAG PRINCESS, WHAT DO YOU DO WITH A KANGAROO, WHERE THE WILD THINGS ARE… so many to enjoy! © copyright Catherine Mann 2019. All rights reserved.